"Sad this cub will grow up without his mama." What officials found being smuggled under the seat of a car this week casts a light on the sad truth about captive tigers in the U.S.
U.S. Customs and Border Protection officials stopped an 18-year-old driving back into California from Mexico and they discovered a baby Bengal tiger hidden on the floor by the passenger seat. The teenager, who initially told officials the tiger cub was just a regular cat, later said that he bought the cub for $300 from a man in Tijuana who was walking an adult tiger on a leash. Now he faces federal charges for illegally smuggling an endangered species, which could amount to up to 20 years in prison and a $250,000 fine. The incident is just one example of the sad plight of endangered tigers in the U.S. Because of the lack of laws against exotic pet ownership, tigers are bought and kept as pets far more often than people may think. When they get too big to handle, they are often sold to roadside zoos and kept in cages their entire lives. "The abuse begins when the cubs are prematurely and forcibly separated from their adult mothers — usually during or immediately after birth — depriving them of normal biological and behavioral development," Lisa Wathne, captive wildlife specialist at the Humane Society of the United States (HSUS), previously explained to The Dodo. "Rather than experiencing the warmth of their mother and interacting with their siblings, the cubs' lives are dictated by the demands of the paying public." There are an estimated 5,000 captive tigers in America, a 2014 report from the World Wildlife Fund (WWF) found, while just over 3,000 tigers exist in the wild worldwide. Since then, people have been pushing for tighter regulations on keeping captive tigers, but there's still a long way to go. 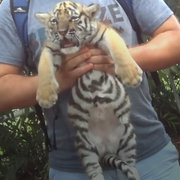 And public awareness still lags: People need to see tiger cubs not as pets or props for selfies, but as fascinating creatures who are in danger because of habitat loss and hunting. 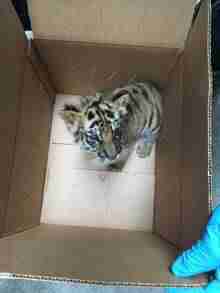 The tiny cub is currently recovering at the San Diego Zoo, where he's getting professional care. "Sad this cub will grow up without his mama," one commenter observed. To help increase the wild tiger population, you can get involved with this campaign.